If you’re using Facebook and/or Instagram to advertise you might want to sign up to join the waiting list for the new Creative Hub. The new tool gives advertisers a new way of mocking up ads, to become more creative through inspiration and to share creative ideas. When to mock up an ad, you’ll be able to preview it in test mode directly from your smartphone and you’ll have a link to send to other people in your team to check the ad and send feedback, before it goes live. This is a feature that could really help you to improve the user experience. Browse the top ads from the leading brands on Instagram and Twitter. Helping you to gain insight into what’s working and to inspire your own creative work. Stay up-to-date with the latest advertising trends by checking out the latest ad formats. Learn more about advertising best practices and gain access to the latest research on Facebook and Instagram advertising. Insights.fb.com will give you the ability to gather all the data you need. You’ll gain access to studies about all the different audiences, spanning devices, generations and geographies. Facebook also claim that they’re working on an API that will allow for more customisable queries to be answered. The Creative Hub waiting list is now open. 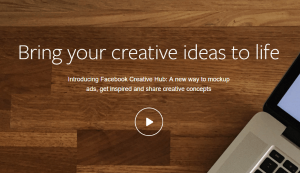 Facebook hope that the Creative Hub will be fully launched by the end of 2016. Get your name on the list and you could gain access a lot sooner. We have multiple social media marketing services available, give us a call on 01905 27007 or send us a message to learn more.